So what’s the latest happenings in our recycling world? I feel a change around us, recently. It could be a number of things; however, I feel like there is an awareness starting to arise. Today, in the dry erase square it said 210. Two hundred and ten tonnes diverted? Right on Williams Lake! “Well, wait a minute,” I thought. This sign is only a few months new. So we had diverted 210 tonnes of recyclables from the landfill since August. That’s a huge pat on the back for us, for sure. The Cariboo cares. With obvious excitement I returned to my conversation with the loader operator. He added he has seen a slow constant decline of recyclables in the garbage trucks coming in and also a little less garbage overall. I have to say with all the new transfer stations around the region operating, and attendants to help divert waste, we haveseen great improvements everywhere. 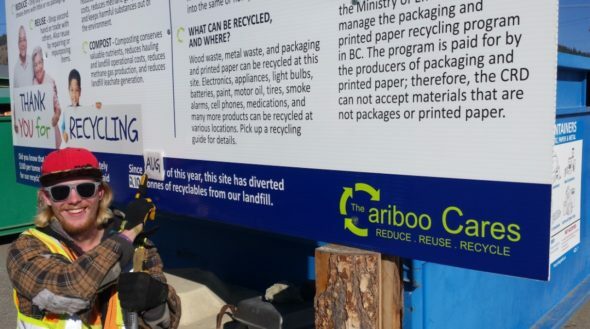 With the Multi Materials BC (MMBC) program in place, us Caribooites have a great opportunity to recycle without it being a huge tax burden on our local governments. However, there is a small detail I should share. If the public does not comply with MMBC’s guidelines, we could face fines or worse, potential loss of the program. When I hear “fines” as a taxpayer, I know who’s pocket that comes out of. mine. I would say not bad. Well, I am a bit of an optimist, so maybe I should say we should be doing better. We have to realize there are some things that are just not recyclable, or more specifically, are currently not accepted in this program for recycling. Some contamination audits on our local recycling bins have come out almost as much as 20 per cent. That’s too high. To be honest, at transfer stations where we have attendants and recyclables are sorted into respective categories, we have better rates. Where we have bins that are unattended, like some curbside recycling totes, we have worse rates. Makes sense. To tackle the issue of contamination, some districts in the Lower Mainland and Alberta have implemented a series of auditors. This team of volunteers, environmental students, or passionate waste diverters, walk in front of the picker truck and scan for items that should not be in the recycling totes. If they find contamination in the tote, the picker truck leaves the tote behind. Simple. In districts where smaller open-top curbside bins exist, the truck driver checks each bin beforehand. If they find contamination, the truck leaves the tote behind. Simple. These curbside recycling programs create a product we call single-stream recyclables. Instead of sorting into many categories, they combine all items into one for ease of use for the public. This is great; however, it causes problems down the line. When this pile of single-stream arrives at the unloading barn, the items get pushed into a trough, compacted in a bailer, banded, and stacked ready for shipping. Upon arrival at the recycling sorting facility, these bails of single-stream get fluffed up and sorted. It is sorted by a series of belts and rollers using gravity for lightweight materials, magnets for steel and tin, air jets and optical sorting for plastics, eddy currents for aluminum, and last but not least, hands. Yes, there are still human hands involved—nothing beats our human hand-eye co-ordination. I tell you all this because it helps explain why certain items cannot be put in these totes. Plastic bags are very hard to sort out after compaction because they get crammed inside all the tin cans and plastic containers. Styrofoam has a similar issue; it crumbles and fluffs up creating little white balls all over the place. Glass is a serious safety issue in this single-stream because when glass is compacted, it explodes. It is not uncommon for a small shard to get stuck in an eye. Lastly, as odd as it sounds, when you pack your recyclables together like one of those Russian dolls,it is very hard to sort because once compacted it does not want to fluff out properly for separation. The same goes for recyclables inside a closed plastic bag. To bring these contamination levels down in our area we can all help by educating each other. There are many resources in our area that can help with recycling at home and better waste management in the business. The Cariboo Chilcotin Conservation Society has a great team of waste and water wise educators that can assist with things like zero-waste events. The Cariboo Regional District has many answers to local waste diversion questions. The Potato House Project is an excellent site for compost education and diversion. 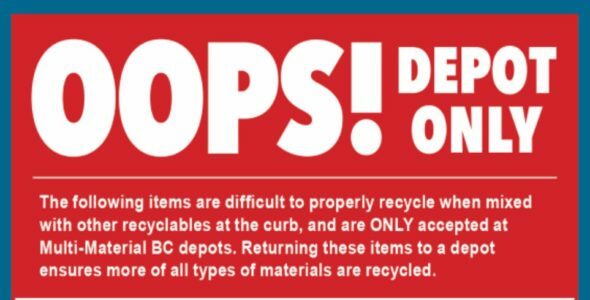 The Recycling Council of BC’s hotline is my main source for recycling questions. And then, of course, there is me. Fairly often I will get a random text message or f-mail through Facebook, where a friend asks for some advice. If you are curious to see how well you are understanding this MMBC recycling program, I can help. If you would like to set up better recycling or waste diversion at your home or business I can help you with that, too. This is not an advertisement, and I am not trying to make a business out of this… or maybe I should? Nonetheless, for the sake of community I’m sure there is some skill or knowledge we could trade for. I do like cookies! I know there are many of you out there who truly want to make a difference, so let us take the path of continuous improvement. Oliver Berger has a 35-year degree in life, starting out in the Spokin Lake area, spending adolescence in Williams Lake, and then venturing throughout the world on a quest of always learning new things. His priorities include dedication to and education about waste management.